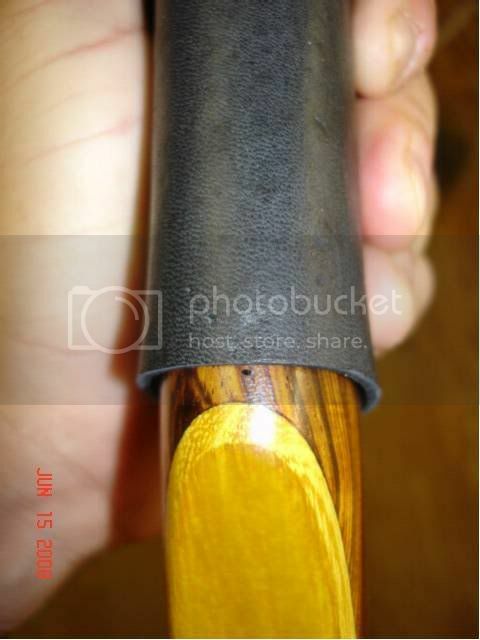 This morning I started my leather grip. 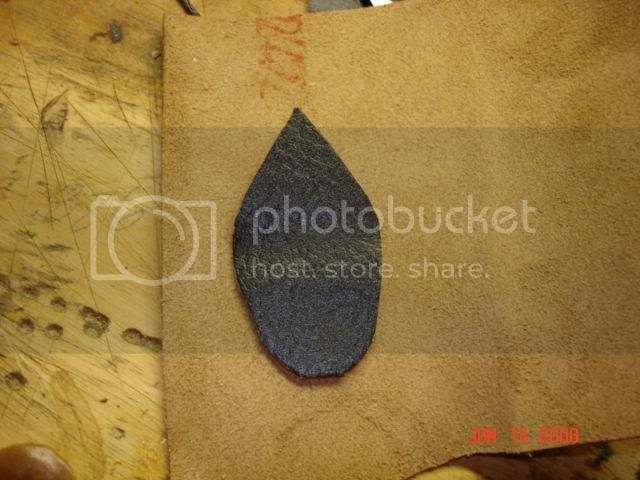 I start with an over-size piece of leather cut square on the edges. Most of mine will be around 4 1/4" tall when finished. I have to cut this one shorter, because it covers the inked specs. Be sure to stretch it plenty as you are trimming. You want a very good stretched fit. 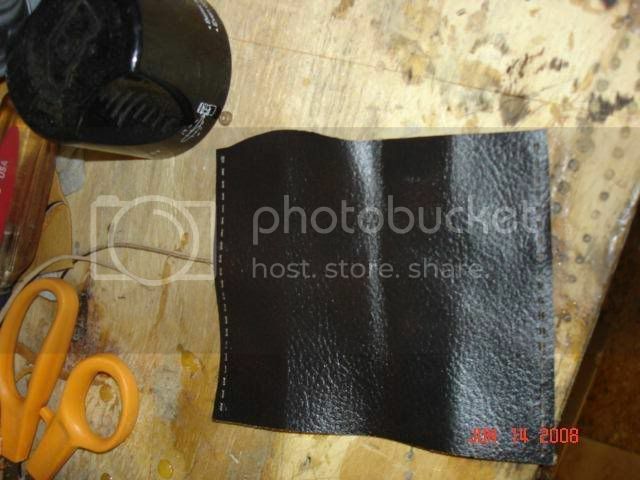 Some leather stretches bunches, this piece does not. 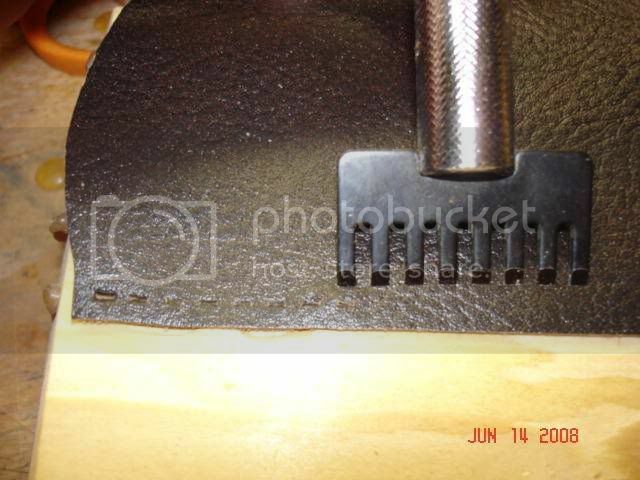 Make sure you use a very sharp blade for your trimming, or it will look ragged. 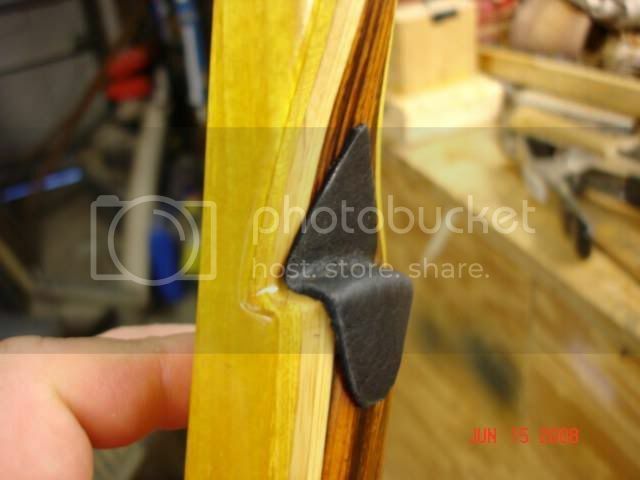 Make sure your top and bottom lines up along the seam. I always cut a little whoop-te-do for the radiused shelf. 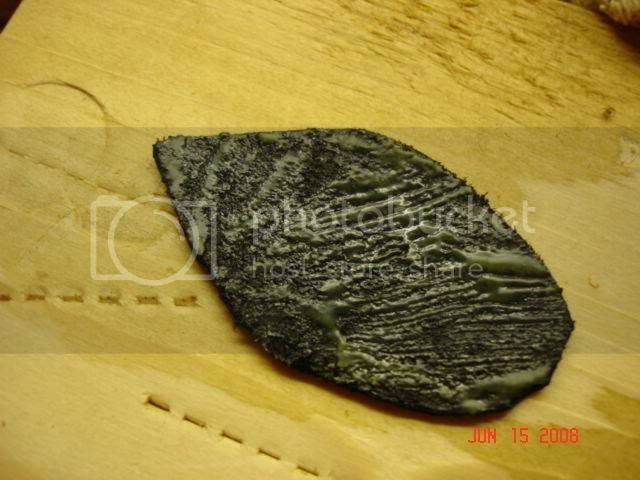 I had to jump ahead with the photos to show you the whoop-te-doo. Dis-regard the holes, because we ain't there yet! 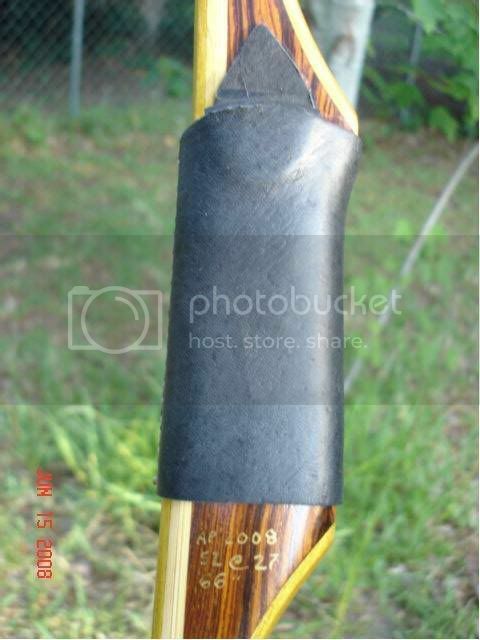 Re: Leather laced grip build-along! 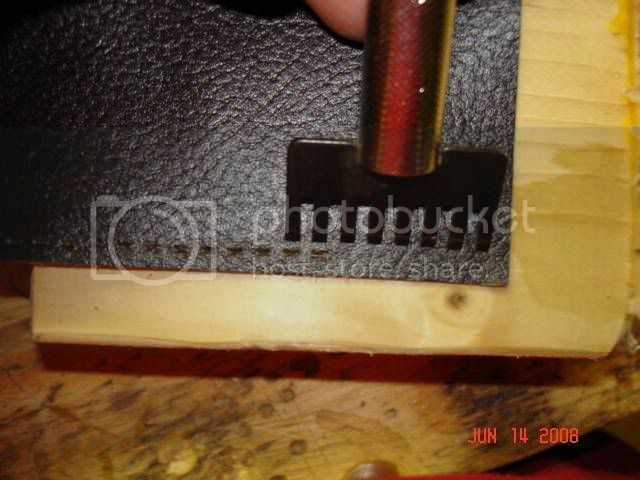 Now you need to mark and cut the width so it lines up, and is the right size. 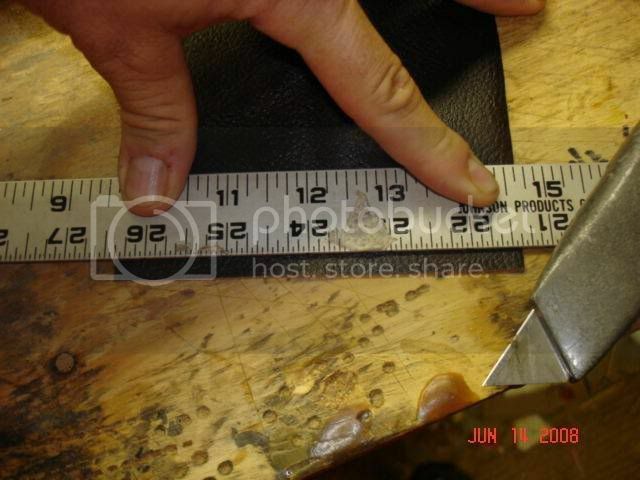 Stretch alot for this measurement and cut. You want to pull it together slightly when stitching it up. You can't pull too hard or you will rip out the holes. A good fit is paramount to a nice grip. It will bunch up under your hand if too big, and have a gap at the seam if too small. 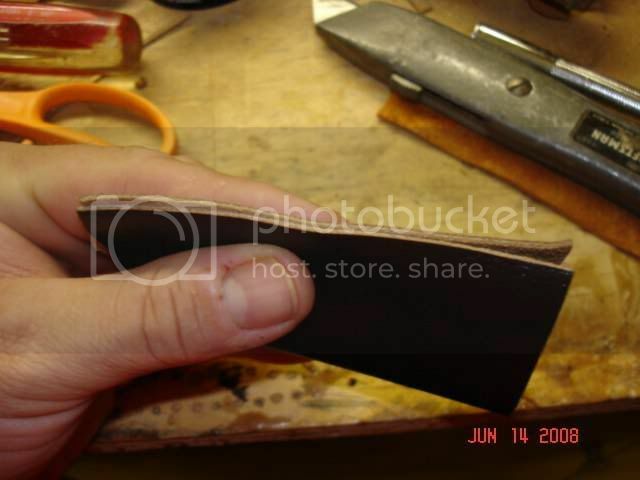 You want enough gap that it takes considerable stretching to get it to meet at the seam. Time to cut a strike plate piece. You can get fancy here if your want, by making it look like an arrow head (Pearson I think), or indian head (Indian). I prefer simple and classic. Fit it as you cut to make sure it looks right to you. I like it to run under the grip wrap at the bottom. Gives it a neater appearance to me. Now to check again that both sides match at the seam. 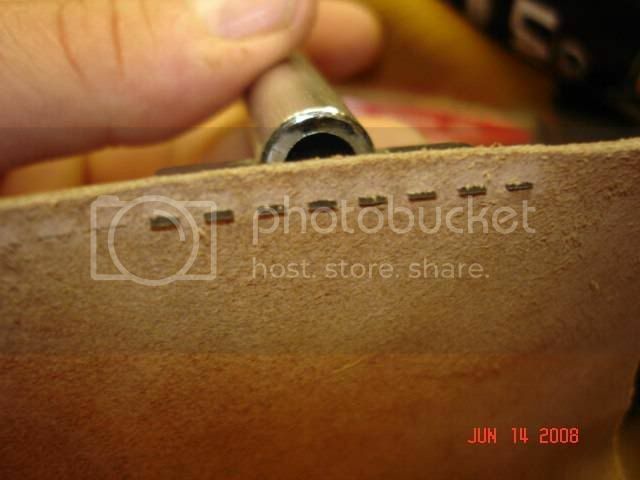 I use a leather chisel to punch my holes. They can be bought at Tandy leather for $7-8. 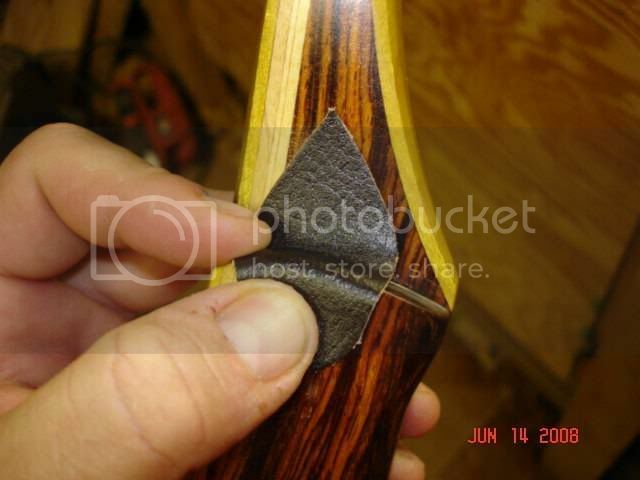 I used to punch round holes, but found that this tool makes for a more finished looking grip with the small slits. 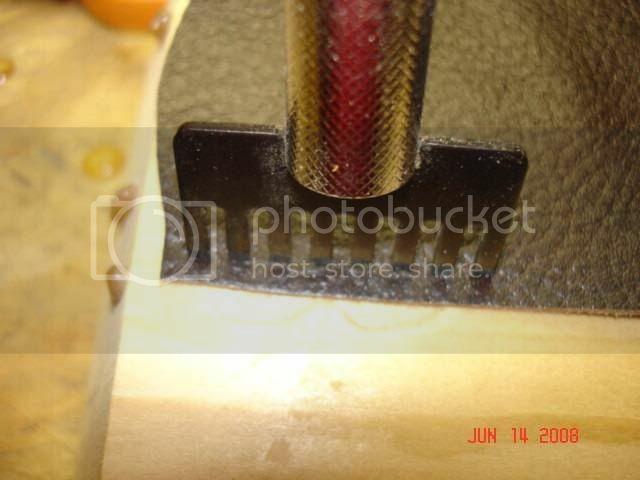 I put the first chisel blade in the last hole to keep my spacing right for the next set of holes. At the end, I have to use the last two holes for alignment, because I ran out of grip. 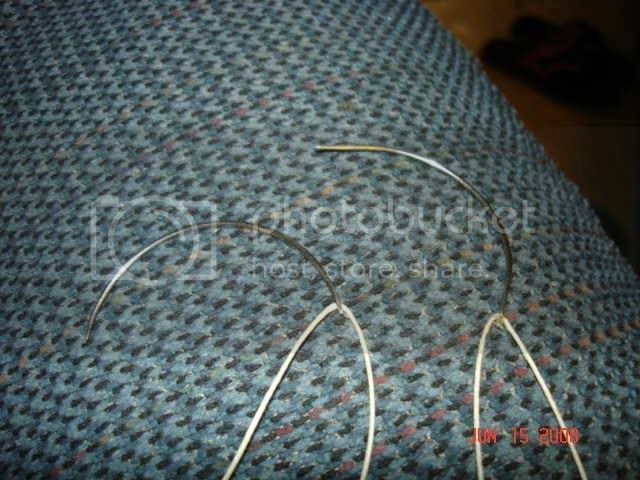 I keep my outermost holes about 1/8" in for strength. 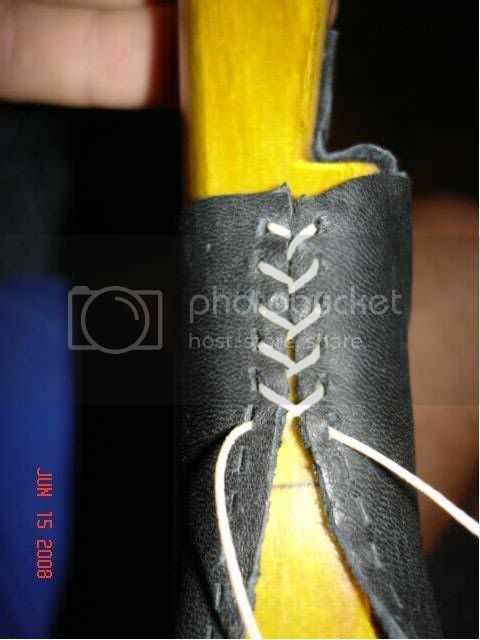 If you cut your holes too close to the edge they will pull out when lacing it up. Everything should line up nice, and they should have the same number of holes side-to-side. This is all for now. I have to let my finish cure for 24 hours before I lace the grip tonight. 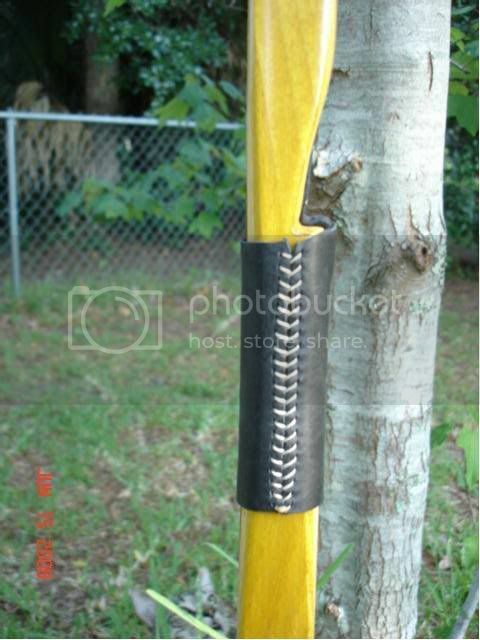 top stuff, i like the idea of tucking the strike plate under the grip wrap. Here we go folks! After polling the good folks on here and other sites, the majority chose the light colored deer skin for my grip. However, many were suggesting black. Black is my favorite, and I found a piece after scrounging around. I prepared it the same as the above piece. I start out by wrapping the finished piece in position, stretching it until the seams meet, and then marking the belly side so that I can get in the exact position when I apply a little glue. 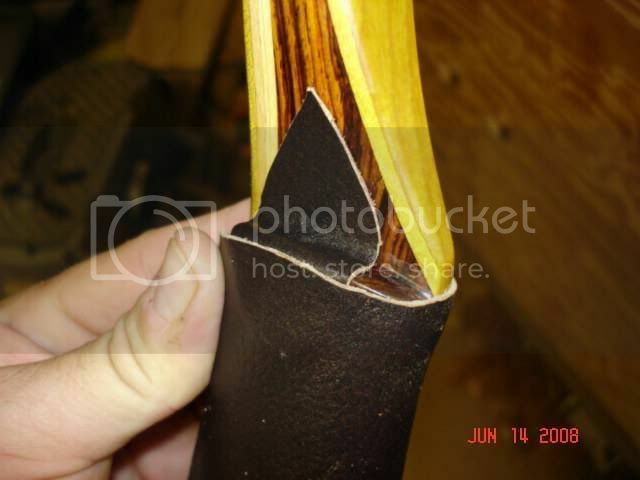 I then trace out my leather strike plate on the bow with a pencil, so I know where to put the glue. 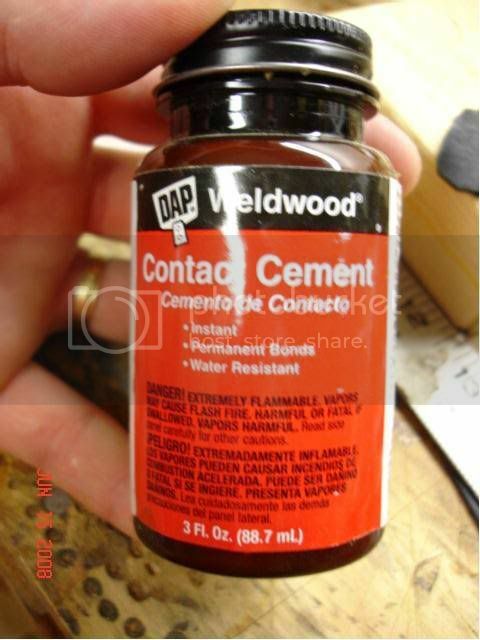 When applying contact cement, or barge cement, be very careful that none gets on the bow except where the leather will be, or it will harm the lacquer finish that I use, and many others. 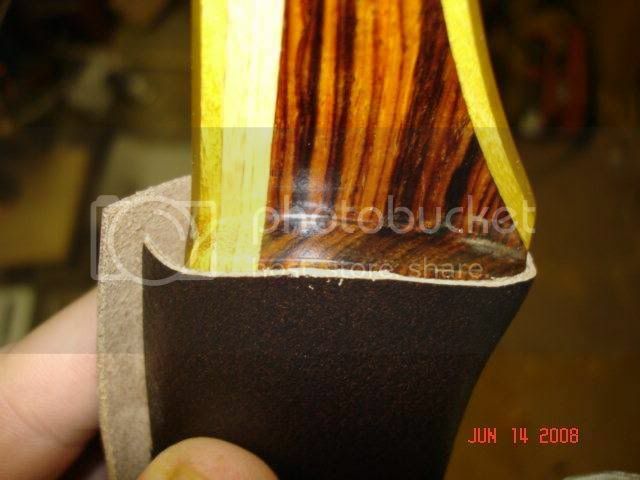 When both bow and leather has dried for a couple of minutes, and is no longer wet, it's time to apply it. 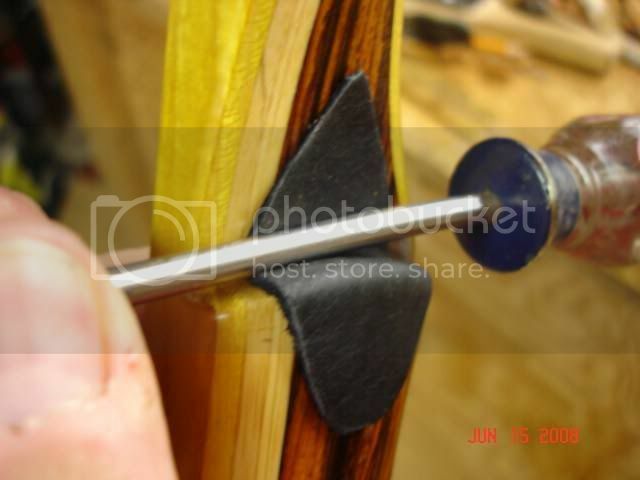 I start my sticking the top point and rolling down the strike plate with a small shanked screw driver. The screw driver makes it seat well in the corner of the shelf. 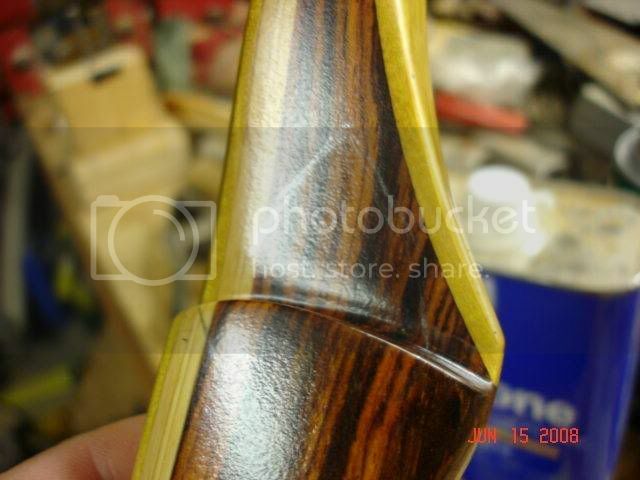 Now it's time to apply glue to the belly side of the bow where the grip will be. 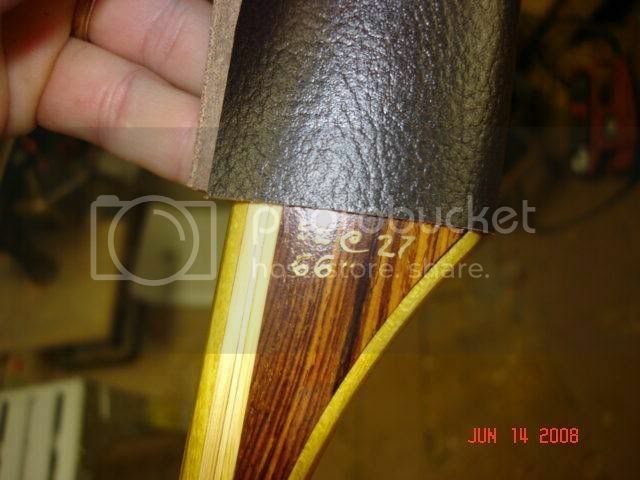 I only apply about a 1" wide strip to the bow and then to the leather. 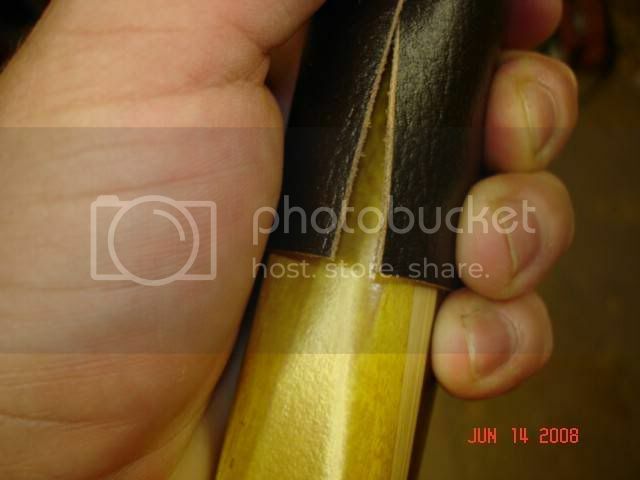 I just want some glue to keep the grip from shifting under my hand when shooting. 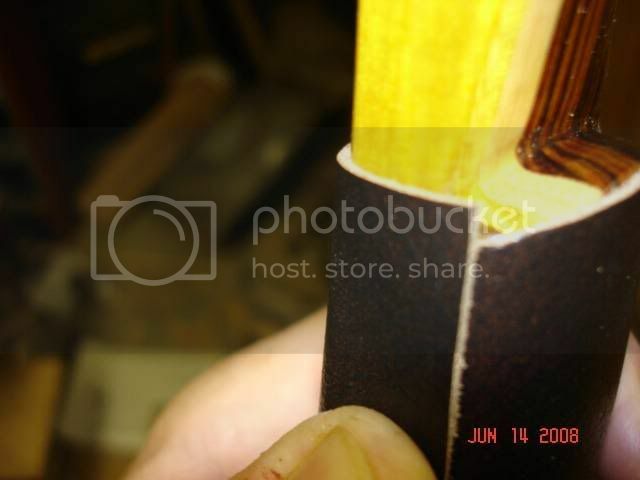 Align the index marks top and bottom, and glue her on. I forgot to photo graph that part. Now for the stitching. 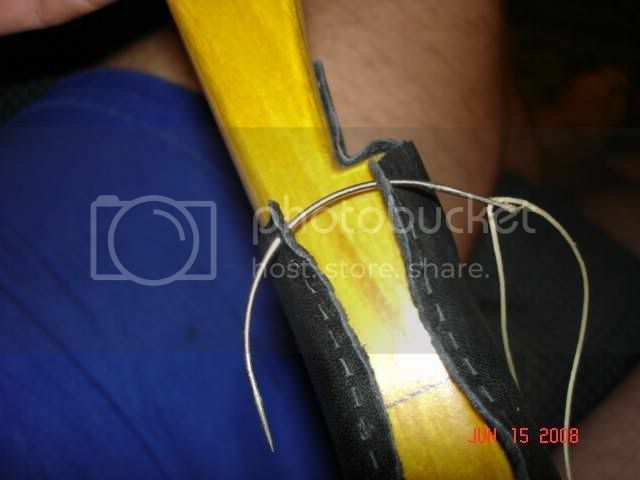 I use two curved needles and about 36" of heavy nylon leather sewing thread. I start at the top like this, and then stitch my way down, always making sure I stitch right over left. 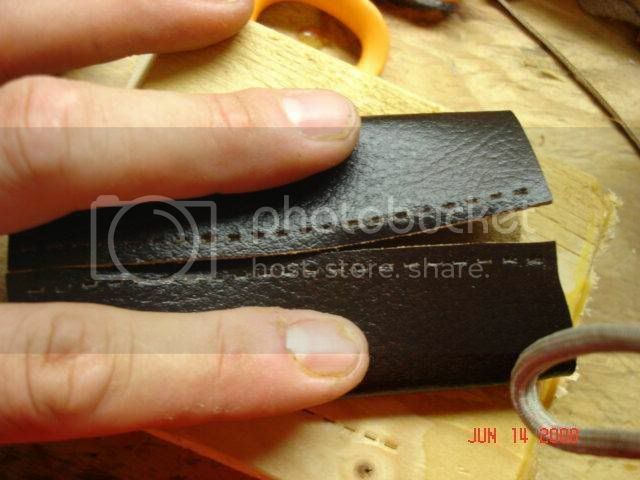 I am constantly pulling and stretching the leather to make sure I don't have to tug too hard on my stitching holes. It will be a stretch fit, so you have to tug as you stitch. It would really help to have an extra hand here, but not necessary. 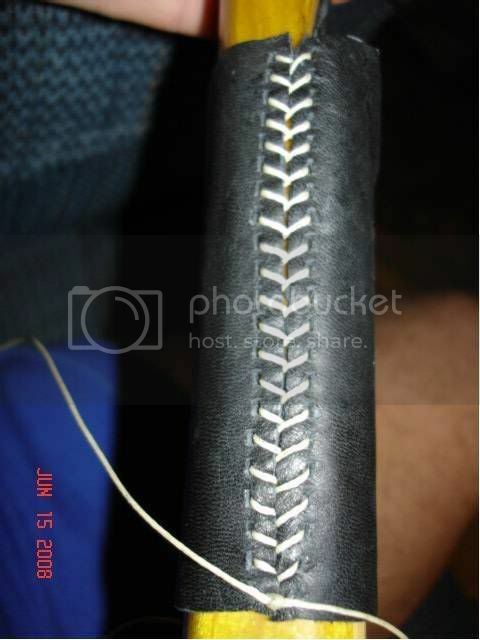 When I get to the bottom I tie one half of a square knot and check my stitches. 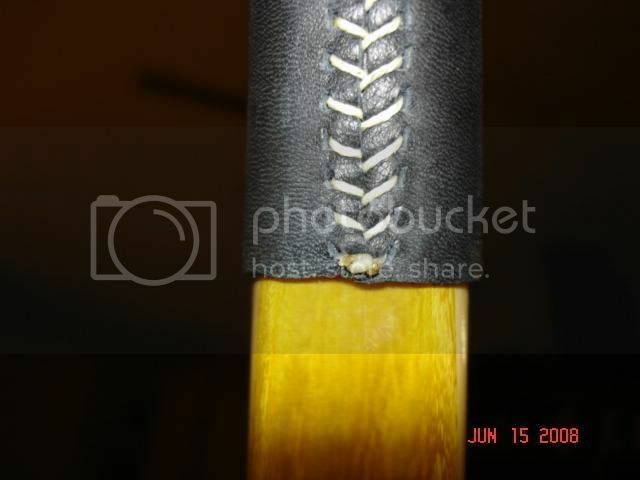 If they are not tight, or the leather is not seaming well, I will use one of the needles to pick at the threads from top to bottom, pulling out the slack. 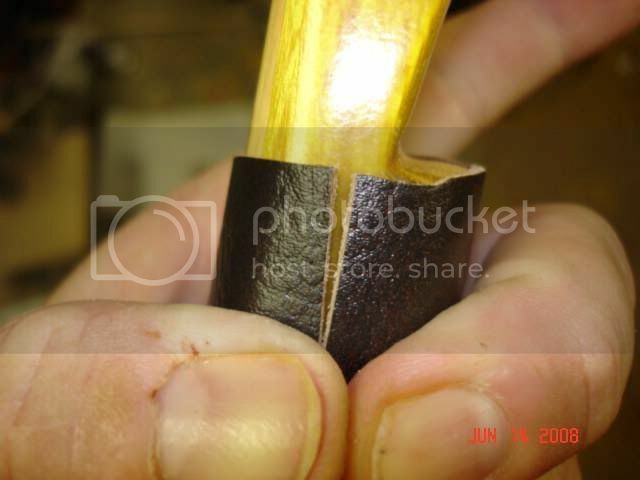 I then finish the square knot and trim to about 1/8" from the knot. I then take a lighter and burn the ends. If you leave the tag ends too long they will burn down, but will turn black. If you burn a very short piece they just turn into little molten nylon balls that are not unattractive. Now for the finished product! Very nice grip, Apex! Well done! I've done several years ago. They looked like crap. I never could figure out that stitch till now. Now I can go back and re do all of them right. Awesome! Great pics and instructions even I can understand. Now show us how to make a buckskin vest. I'm glad you guys have enjoyed it. I am self taught though, and don't even know the name of this stitch, not that it matters. This is how I do it, but I'm sure there are better ways that I haven't figured out yet. I am glad I discovered this. I have one made up for my T/C and was wondering how to stitch it - I now know. Just one question Apex man. 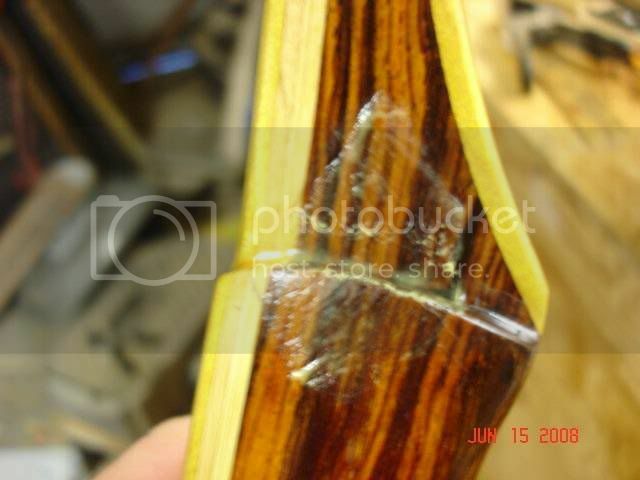 Does that contact glue ruin the finish on your bow? 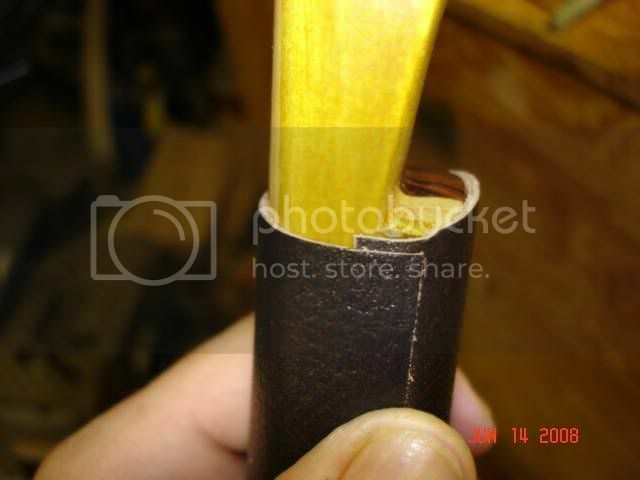 In other words when the leather gets old or you have to take it off (or better still you don't like it anymore and want to go back to the wooden grip), does pulling it off tear the and wreck the timber and finish? I softens the laquer that I use, but is really easy to touch up. 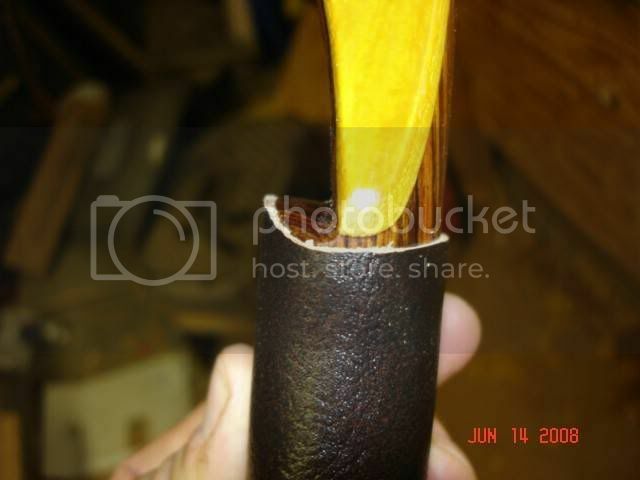 Harder epoxy finishes should handle it, I think.